One of our favorite towns that’s really close to Kalispell is Whitefish. We probably drive the 15 miles there at least 2 – 3 times a week. Our first stop is always at the Great Northern Brewing Company for a pint of their Wheatfish hefeweizen-style beer. We also learned last night that every Wednesday from 5:00 p.m. to 8:00 p.m. is happy hour and the beers cost $3.00! And that’s about all I remember of last night…. We also discovered shuffle board and darts in a back upstairs room that is a little more private if you need a break from the crowd that surrounds the bar. 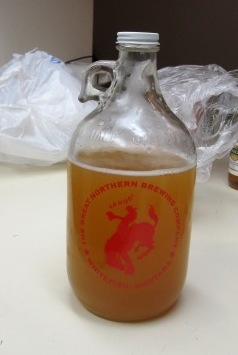 One of the best things about the brewery is their growlers. A growler is basically a jug of beer that you pay around $12.00 for and then every time you come in they refill it for you for $7.00. Hence the several trips to Whitefish every week. After hitting the brewery last night we went to eat dinner at Pescado Blanco. This was my second visit and the Southerner’s first. Every person I’ve asked to tell me their favorite restaurant, has named this place. EVERY person. Pescado Blanco is an authentic Mexican restaurant that is also now officially my favorite restaurant in town. I would like to make love to their pork tacos and give a deep-tissue massage to their enchiladas. And hail to the queen for corn tortillas! Throughout our entire meal I kept looking at the Southerner and repeating these words “I’m so happy right now. I’m just so happy.” This feeling might have been enhanced by the margarita I had before dinner (home-made and refreshing tasting) and the glass of Cono Sur I had with my meal. 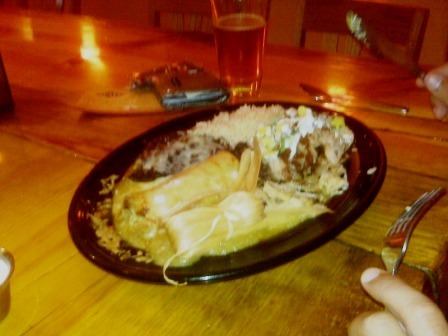 In addition to the tacos and enchiladas, we tried their steak fajitas and tamales. While all of the main ingredients in the fajitas (onions, peppers, mushrooms, guacamole, cheese, etc.) were fresh and well-prepared, I could use a little better quality beef on this plate. The pork tamale was bordering on dry with not enough meat in it. I have a feeling it can be a lot better on a different night. But I can’t say enough about the corn tortillas! Thank you Mexican-Food Gods for allowing me to find a tiny piece of heaven in a town the size of a thimble. I’ll never blaspheme you again by entertaining the thought of visiting Taco Johns drive thru. This entry was posted in Montana, Tacos. Bookmark the permalink.